The decade of Marvel events can essentially be split into two halves, with the first half culminating in Secret Invasion. The second half of events spins out of Secret Invasion, into Norman Osborne’s Dark Reign, ultimately culminating in Siege. As Marvel events go, Siege is one of the more focused titles, centering around Osborne’s plans to overthrow Asgard, and remove the Asgardian god’s “threatening presence” from U.S. soil. The events of Siege really do mark an end to an era, concluding with Brian Michael Bendis’s New Avengers Finale after a Marvel U altering 6+ year run. The reading orders below include first a collection of all relevant trades, followed by an issue by issue reading order list. With the trade reading orders, I generally recommend knocking out the primary issues first, but I realize it’s often more fun to jump around issue by issue. With these orders you can do both. Any questions or comments with any of this can be sent here. Otherwise, happy reading! If you’ve already kept up with your Dark Reign reading, this prelude is going to offer a lot of redundancies. If not, and you want a quick recap before Siege, this prelude sums up the state of the Dark Reign Marvel Universe fairly succinctly. The primary Siege trade collection is very comprehensive, including SIEGE: THE CABAL, SIEGE PROLOGUE, SIEGE 1-4, SIEGE 1 DIRECTOR’S CUT; NEW AVENGERS 61-64; DARK AVENGERS 13-16. For all the Ben Urich, Frontline lovers out there. Includes a variety of tie-ins that take place during the battle for Asgard. Tie-ins for all of the following: Spider-Man, Young Avengers, Loki, Captain America, & Nick Fury’s Secret Warriors. I wouldn’t have thought that Volstagg and Victoria Hand would’ve been my favorite characters throughout Dark Reign and Siege but they were. These two events are also probably my favorites out of the modern era ones. The issue “Fallen (not official title at present)”, is that the one called “Sentry: Fallen Sun”? Just a note for Marvel Unlimited Readers. Origins of the Siege #1 is labeled as Siege Digital Prologue #1. Took me forever to find it on unlimited. New Avengers #61 & #62 should definitely go before Siege #1, because until then the rest of the New Avengers don’t know that Steve Rogers is back. Hey. So where is the Siege: Loki in the issue list? And the other one shots? Is there a reason the event Heroic Age isn’t included here after Siege? I have just finished Siege and I am also kind of wondering this. I don’t really know what to pick up next. Chaos War doesn’t really seem relevant for the Earth continuity and not even Fear Itself for the matter, but there’s a huge gap between Siege and Avengers vs X-Men. If you could clarify us it would be wonderful! And great job with the site! Yes I’m wondering the same. A Heroic Age guide has been added to the reading order! Between Siege and Avengers vs. X-Men a lot of stuff happens. I’ll give you a quick summary of events. Note: events in between “(…)” are optional. – Dark Reign: This period rather than an event includes X-Men: X-Nation, which is not part of Dave’s Dark Reign reading order I might note! 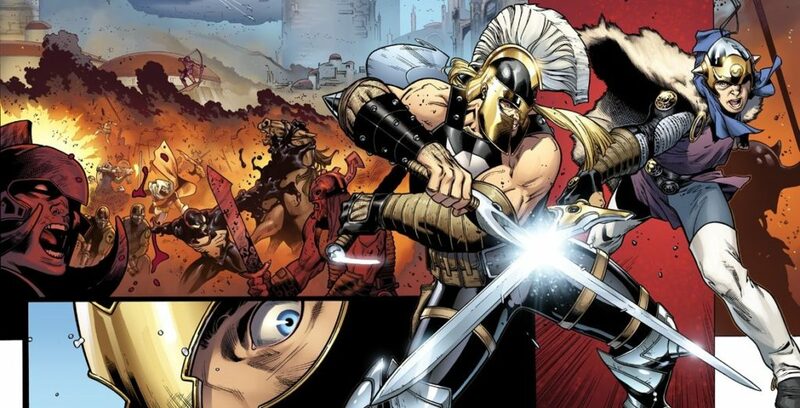 – Realm of Kings: This follow up event of War Of Kings takes place during Dark Reign, and should be read between Mighty Avengers #31 and #32, as they have a guest spot. – Timestorm 2009-2099: fun Spider-Man/Spider-Man 2099 event. – X-Men: Necrosha: Dave only has X-Men: Messiah CompleX on the list, which is only the beginning of X-Men events. This is the one after X-Nation is established, and leans heavily on X-Force, so you might want to be up to date with that (excellent!) series. – Incredible Hercules: Assault on New Olympus: this event is the Olympian counterpart of Siege. – Hercules: Fall of an Avenger: You might want to read this after you’ve read Assault. – X-Men: Second Coming: What got started with Messiah CompleX gets finished here. Read the Cable series of the same period and X-Men event Messiah War to be fully up to date. – Fall of Hulks and World War Hulks: These Hulk events are closely tied. Hopefully that fills a bit of the gap. Just finished this entire series! Thanks for laying it all out for us. This one is quite the rabbit hole – so many side stories, seemingly unrelated to the overall Siege story (Thor and Thunderbolts, specificallly). And then there’s Ultron, whose appearance felt a lot out of place. In the end, it was a really enjoyable story minus those little side journeys – never thought I would get to Thunderbolts via the death of Captain America! I had forgotten about the oddball Ultron inclusion, nice call! Siege is a pretty entertaining, overlooked event at this point. A solid culmination the New Avengers ride.